The structure comprises two parts, the first one located at the heart of the city and the second one standing in the old part of the town. Rajbada palace exhibits a blend of Maratha, Mughal and French styles, the palatial structure is sure to leave you spellbound. The entrance itself is beautiful with lofty archway and a giant wooden door covered with iron studs. As one makes his way through the entrance, one is greeted with a courtyard comprising arched Ganesha hall, a number of balconies, windows, and corridors, surrounded by galleried rooms. The lower three floors are made of stone and the upper floors are made of wood. 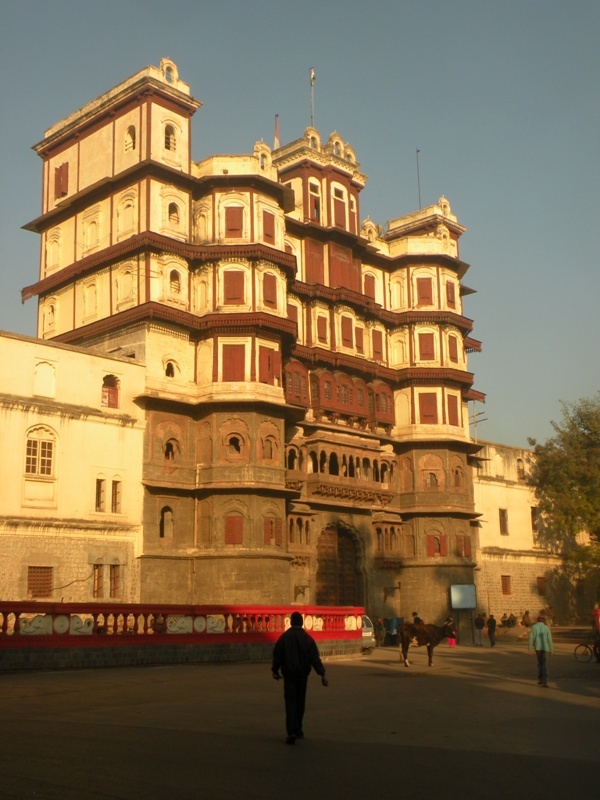 Rajwada has been burnt three times in history. The last fire broke out in 1984 and caused the maximum destruction. The lower three floors are made up of stone, while the top floors are made of wood. This made it very vulnerable to destruction by fire. Now, only the front part of the original structure remains. The palace has recently been renovated, which has managed to bring back the old glory to some extent. In the rear part of the palace, a beautiful garden has been created. It contains fountains, an artificial waterfall and some magnificent pieces of 11th century sculpture.